Mark Wicken is an educator, executive recruiter, and marketing professional with more than 30 years of marketing, advertising and communications experience in the United States, Canada, and the Middle East. He has held senior account management positions with several multi-national advertising agencies and has been responsible for accounts including IBM, McDonald’s, Esso and General Motors. He was Divisional Vice President of Marketing for Canada with Domino’s Pizza International as well as Director of Marketing for KFC Restaurants in the Middle East. Mark successfully transferred his experience into executive search, and established The Mark Wicken Group, a business specializing in executive search within the marketing, advertising and communications industries. Mark has devoted much of his life to teaching, education and youth development and is the Past President of MusicFest Canada, the largest annual education-based music festival in North America. He has been an instructor in job search, presentation skills, resumé writing, interviewing skills and marketing at several colleges, universities and private institutions. Mark understands job search, the hiring process and the obstacles every new graduate faces as they move into the business world. As a business professional, educator and executive recruiter, Mark has studied all aspects of the job-search process. 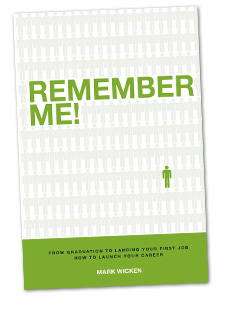 He has written this book to address the specific needs of those entering the job market for the first time.